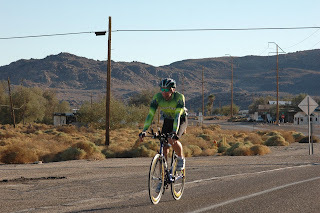 My Journey on the Furnace Creek 508! After 37hrs and 50mins, I completed my journey, safe and well. After a long night, we made it out of Death Valley. Nick went strong climbing out of the valley in the dark. He took a few cat naps, but was never out of the saddle for more than half an hour. We made it into Shoshone as the sun was coming up. There was wind leaving TS#4, but he kept a steady pace. He had a breakfast of turkey sandwich and that got him into Baker. 50 miles in and looking strong. There was some wind and fog up at mile 24, at Johnson Summit. We're back down the mountain and it has been warming up. We're at the base of a wind farm, prepped and waiting. 2007 - The Furnance Creek 508 - "48 Toughest Hours in Sport"
The 508 was more than just another race, it was adventure spanning 508 miles of some the harshest desert climate California has to offer. It has been over 6 months now since the 508 but no matter how time passes I remember every moment like it was yesterday. 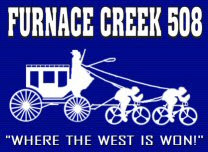 I've thought long and hard about how to describe it rather than mile by mile description, I have create the my 25 top moments to the Furnace Creek 508. 25. The excitement of starting the race with the uncertainties that lay ahead. 24. The winds from miles 60 to 83, heading to California City. 22. After swapping to my Tri-bike my back wheel starting jamming against the frame, luckily my support crew was only 6 miles away at the top of what became a long and very slow climb to Randsburg it felt like I was cycling through mud. 21. The turn I missed out of Randsburg, luckily my support crew tracked me down very quickly and point me the right way! 19. As the dusk came, I was suddenly reminded of the opening sequence of Knight Rider, with the car race through empty desert roads. 18. 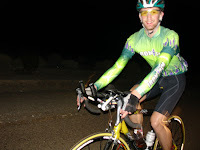 With the support car's headlights casting a 50 foot shadow of my legs cycling in front of me I could see the repetitive motion and I felt like giant going through the night, at this point I got the Imperial March from Star Wars stuck in my head. 17. Seeing the climb up into Death Valley in the distance, the road was illuminated with the flashing lights from the support cars of the riders, with the road weaving up the mountain it looked like a string of Christmas lights. 16. One of toughest climbs of my life starting at mile 200 to Townes Pass, like the local Old Honda Road, but 6 times longer. 14. 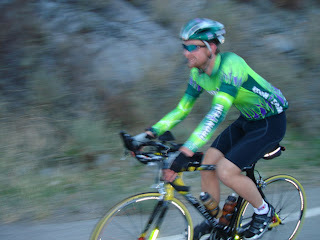 Actually passing other riders on the Townes Pass climb! 12. Transition Run to the bathroom at Stove Pipewells, after 225 miles on the bike I could still run! 11. 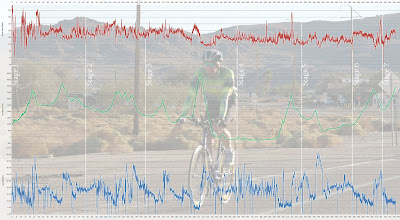 Asking if there was something wrong with my bike again after leaving Stovepipe Wells, as it seemed I was going very slowly, my support team replied "Nicholas, you are on a hill, that's why your going slowly"
10. Trailblazing through Death Valley on my tri-bike, averaging over 20mph having been riding for over 240 miles. 9. My night-time sunglasses coming apart as I wiped the salt from my forehead as I was cycling through Death Valley and having to go back to retrieve them. 8. The climb out of Death Valley that seemed to go on forever, the top always seemed to be around the next corner as the Sun was slowly rising, for my second day of riding. 7. Realizing I needed to switch my sun glasses for day time riding as I was blinded going into the descent of out Death Valley. 6. The most incredible view coming down the Ibex pass, into another valley where the road stretched out far into the distance, like there was no end. 4. The Ice Tea my support crew put in a water bottle for me, this was a nice change from Accelerade and Gatorade. 2. The long slow climb from Baker to Kelso with over 25 miles of climbing this was the longest up- hill even though not steep it was very exposed starting through the Mojave Desert, it was getting later and later in the day and this hill went on forever. 1. What my mother said to me before the race "When do your race think of Grandfather and his battle", my Grandfather had been in hospital for the past week and was not doing well. 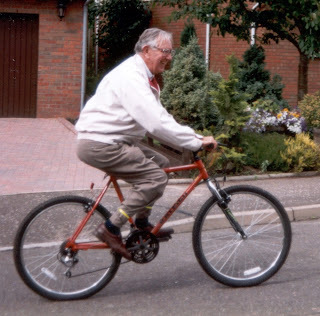 At some level I believed if my body could survive the 508, my Grandfather could win his battle too. With over 33hours and 434 miles, I was barely able to keep my head up though my legs were still strong. 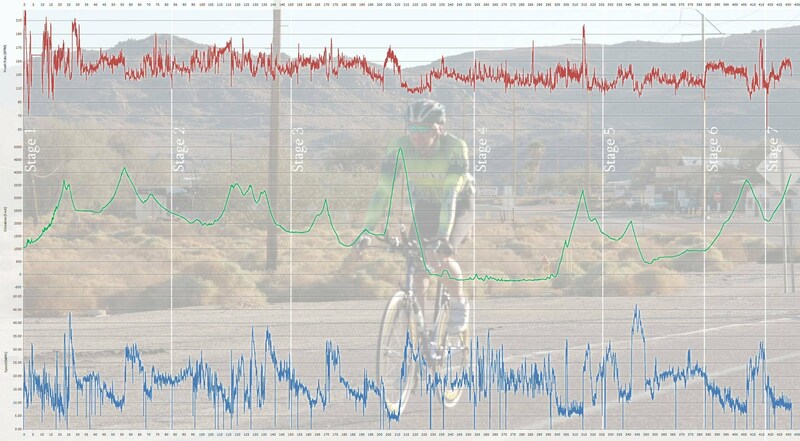 I had surpassed my longest ever ride by over double the distance, my training for the year had prepared me for the Ironman just 5 weeks earlier but not this. My body had simply run out of fuel, there was only 74 miles to go and plenty of time. But I had pushed through the pain for too long and my body needed to stop. It was a tough decision to make, but I do not doubt it was the right one. It is a course that commands respect with it's harsh, vast, empty, lonely and beautiful 508 miles. The next morning I found out my Grandfather had past away, we both lost battles that weekend, though I did not lose the war, I will go back next year and ride in his memory.